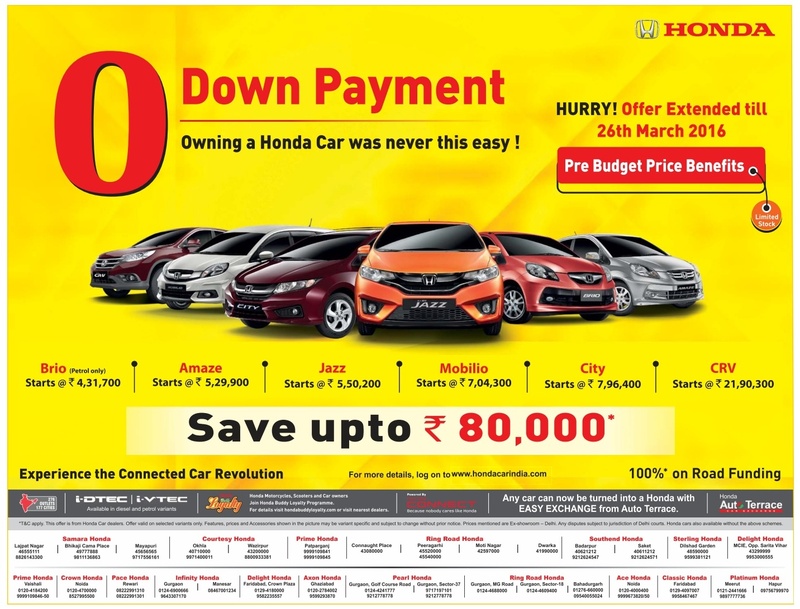 CityShopDeals Automobiles Bangalore BangaloreAutomobiles Delhi DelhiAutomobiles Hyderabad HyderabadAutomobiles Mumbai MumbaiAutomobiles Never before offer on Honda Cars | Zero down payment on Honda cars | April 2016 discount offers | Holi festive offer. Never before offer on Honda Cars | Zero down payment on Honda cars | April 2016 discount offers | Holi festive offer. Never before offer on Honda Cars. Zero down payment on Honda cars. Best discount offers in 2016 march. Holi festive offer. Get discount benefits up to Rs 80,000. 100% (full) on road funding. Offers applicable on Brio, Amaze, Jazz Mobilio, City and CRV. This offer valid all over India including all metro cities: Bangalore, Hyderabad, Mumbai, Delhi, Chennai, Kolkata, Pune, Ahmadabad, Lucknow and Jaipur. Conditions apply.